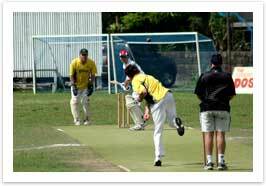 Nomads Sports Club was founded in 1914 and cricket has been on the playing agenda since the club's inception. 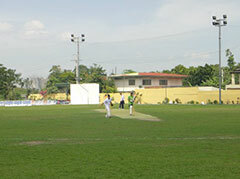 Nomads have the only grassed cricket-playing arena in Manila and is primarily played in a social format by the expatriate community. The Philippine Cricket Association was established in June 1999 with a goal of promoting and developing the sport in the Philippines. The PCA has its official base at Nomad Sports Club. Ground facilities consist of an artificial grass matting wicket on a partially prepared/rolled grass strip. The playing field is shared with rugby, football and numerous other sports and consequently preparation and maintenance of the pitch is restricted. Because of this batting is permitted at one end only. The cricket season is dictated by the seasonal weather conditions and generally commences at the beginning of October and concludes at the end of May. Local league games are organised on a weekly basis playing on Sundays from 10am - 3pm. The usual format is a one day competition consisting of 25 overs per innings. Regular league teams during 2003 season have been limited to the Nomads Cricket Club and the Indian and Pakistani cricket teams.